Hartlepool Folk Festival is back for its fourth consecutive year with a programme of artists, specially-commissioned events and intimate gatherings in venues across Hartlepool. The festival is over the weekend of Friday, October 19, to Sunday, October 21, and once again there’s a packed programme to look forward to, featuring some of the biggest names in folk music. Headlining the event will be BBC Folk Band of the Year Lankum and there will also be performances by, among others, Kathryn Tickell, Edgelarks, False Lights, Melrose Quartet, Blazin’ Fiddles, Tim Edey and Roy Bailey. The festival’s centrepiece this year is ‘The Bishoprick Garland’ – a show with a unique connection to Hartlepool which has been specially-commissioned for the festival. It’s based on the book of the same name – a miscellany of songs, stories, historic ballads and myths drawn from all over County Durham - published in 1834 by Sir Cuthbert Sharp, the noted historian and antiquarian who was born in Hartlepool. From terrifying legends like the Lambton Worm and the Beast of Brancepath to ghost stories, local history and songs like the Keel Row and the Collier’s Rant, Sharp painted a lively picture of the country’s unique character. This rich treasure trove is explored in a new performance of stories, songs, music and dance with a superb cast of performers including Kathryn Tickell, Jim Moray, The Wilsons, Julie Murphy, Alistair Anderson, Benny Graham, Johnny Handle, Harri Endersby, the Kingsman Clog Dancers, the Redcar Sword Dancers and storyteller Ursula Holden Gill. Recent graduates of the Northern School of Art have created fabulous projections which give the show a unique visual dimension and bring the book to life. 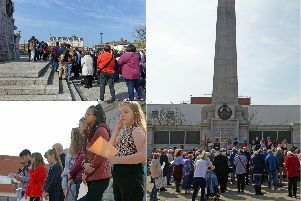 Thanks to the support of Hartlepool Borough Council, the festival, which has sold out for the last two years, has this year upscaled its main stage events from the 400-seat Town Hall Theatre to the 1,200-seat Borough Hall. Daytime performances and activities will still be at the National Museum of the Royal Navy Hartlepool, with performances, workshops and activities happening across the site, including onboard HMS Trincomalee. Joan Crump, Festival Director, said: “As always, we have some exceptional artists lined up, and there’s a rich and diverse programme of events to look forward to. The festival is supported with public funding from Arts Council England. Tickets for the individual events start from £10 per person (children under 12 are free) - to purchase them or for more information visitwww.hartlepoolfolkfest.co.uk or call 01429 299330.